The law relating to partnerships is over 100 years old and is very basic indeed. It doesn't reflect how modern day partnerships operate. A good agreement therefore should not only improve on the default provisions, but also include paragraphs that set out in greater detail how your business will work. 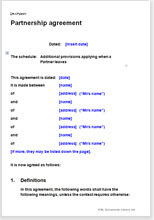 A partnership agreement is not specific to a particular type of business. Its purpose is to set out the arrangements between the parties about how they will work, in much the same way as a shareholders’ agreement for a company. So this template is as suitable for a trade business as for a partnership of architects.